Back from a short hiatus! I’m just getting over a flare-up of my fibromyalgia. I’ve had it for about 8 years, and usually I manage pretty well, but when I push myself too hard for an extended period of time, I pay for it afterwards — this time for a couple of weeks. For anyone who’s not very familiar with this condition, it’s what’s often referred to as an ‘invisible disability’: you can’t tell just by looking at someone that there’s something the matter with them. When it’s at its worst, every muscle in my body hurts, from head to toe, and I feel like I’ve come down with a bad virus. Most days, I just get tired by the end of the day, but the biggest challenge for me is to try and keep fit. If I don’t exercise, my muscles lose all their tone very quickly, but if I exercise too much (where even an extra five minutes could push me over the edge) I end up feeling so achy later that I can’t do anything other than huddle on the couch with a cup of tea. For some reason I can be much more active on a trip, but the most frightening thing that ever happened to me as a result of my condition also happened while travelling. Several years ago we spent a few days on the island of Mauritius at a very nice beach resort called Legends, on the northern shore of the island. The beach had quite a steep drop a few yards from shore, which I knew, but what I didn’t realize was that the drop curved inward instead of running in a straight line. I’ve never been a really strong swimmer, but strong enough to pass swimming tests when I was a kid, so I never worried particularly about drowning. This time, though, I was bobbing along through the water parallel to the shore when I suddenly found myself in water way over my head. I tried to return just a yard or so to where my feet could touch the sand, and it was a struggle — my muscles just weren’t giving me much movement, to the point where I had to fight not to panic. After what seemed like an eternity I was finally able to reach solid ground, but that short journey had been touch-and-go. I stayed well close to shore after that, having been made terrifyingly aware of how much strength I’d lost because of this strange ailment. 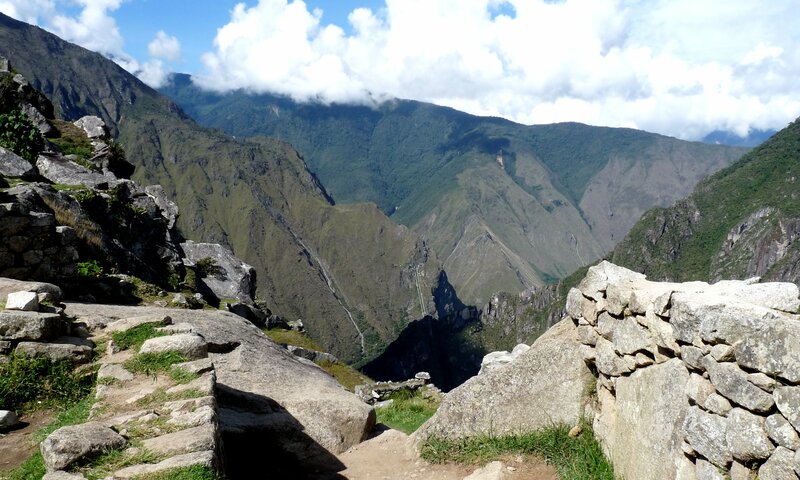 Last fall I was able to hike around the ancient citadel of Machu Picchu for three hours and enjoy every minute of it. I wasn’t in the running to do the strenuous 4-day hike up the Inca Trail, but that was okay because we thoroughly enjoyed the atmospheric train ride from Ollantaytambo to Aguas Calientes through the Urubamba Valley, winding along the same route that Hiram Bingham hiked just over 100 years ago when he became the official ‘discoverer’ of the Lost City of the Incas. As our train snaked along the river bank, through lush cloud forest, we watched the clouds come in over the towering mountain peaks on either side in the darkening sky. The next morning, from Aguas Calientes we took a death-defying bus ride (well, not really death-defying, but not for the faint-of-heart) along a narrow dirt road that climbed up to the citadel in tight dusty switchbacks clinging to the edge of the steep mountainside. At the top, in the crystal-clear morning air, we hiked through more cloud forest until we rounded a piece of the mountain and saw the entire city laid out before us, rising and falling across the mountain peak. Machu Picchu is fascinating, but what’s even more awe-inspiring is the setting. You stand on a dirt path amid the stone houses and look down several thousand feet to the Urubamba River undulating far below, with nary a fence to keep an unwary walker from falling over, but all around you there are deep blue-green mountains that swim among the clouds, and ancient sacred animals like the puma and the condor imprisoned in the towering stones. Life throws us a lot of curves, so it’s important to celebrate what we can do and live life to the fullest as long as we’re able. I’d love to hike to Everest Base Camp, but I doubt I’ll ever be able to. Nevertheless, I’ve stood among the clouds in South America. I’ve had a spider monkey sit on my head, I’ve looked at wild orchids so small you need a magnifying glass to see them clearly, I’ve ridden on a reed boat at the roof of the world. There’s still plenty to enjoy.